Charlotte, North Carolina (CNN) - Officials with the Democratic National Convention said Tuesday that they will have a contingency plan ready in case storms interrupt their plans to hold Thursday evening's convention activities outside. But "we are rain or shine going forward," said a senior Obama campaign official who spoke Tuesday with CNN reporters covering the convention. "There are too many organizational benefits to being outside. The fact that we've already given away 65,000 tickets is probably good reason to have" it at the stadium, the official added. Tuesday's forecast for Thursday predicted a chance of rain and thunderstorms in the late afternoon and early evening, the day when the DNC moves to Bank of America Stadium. President Barack Obama is to accept his party's nomination and deliver a speech that evening. 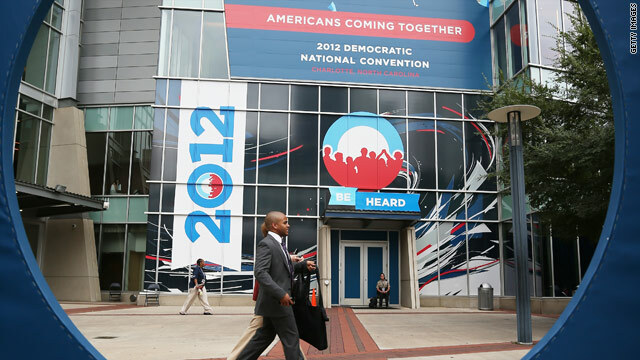 Convention activities earlier in the week will take place at the Time Warner Cable Arena. CNN first reported that contingency plans were being developed for severe weather last Thursday. The campaign official suggested rain alone would not hold up their plans for outdoor events later this week. "Unless someone tells us there's a threat to public safety, then we'll make a different call," the campaign official said. "But we're going to go as far as we can. If it's a little rain, we'll be OK. Rain or shine, we're going." Thunderstorms are expected earlier this week, when convention activities are to be held indoors. Storms with heavy rain are forecast for Tuesday afternoon and evening. Thunderstorms, but fewer of them, are forecast for Wednesday. Republican National Convention officials shortened their convention in Tampa, Florida last week as forecasts showed Tropical Storm Isaac on a path towards the host city. Isaac later became a hurricane and made landfall in Louisiana. What's the buzzword this week? Forward. Obama IS the biggest threat to America's safety and stability... , HELLO!! What will 65,000 people with FREE Bank of America Stadium tickets do if it rains!? Get a big fat stimulus bailout like BofAt?? the biggest threat are the billionaires buy the election. 1. "R" does not mean "Racing gear" it means "reverse"
2. No matter how fast you go, driving by using the rear view mirror never ends up with good results! Demwit – You're either too ignorant, or a revisionist, either way, it was Bush that bailed out the banks. Poor Kayla, the corrupt uninos have been buying and stealing elections for years, how else could we end up with the most corrupt, incompetent, inept president in our history? Remember that Black Panthers standing infront of a polling place with clubs is fine according to the Obozo justice department, but asking for identificationis horrible according to the same bunch of regime toadies. Mitt Romney said the biggest threat to America is Russia. Not China. Not Iran. Not terrorists. Russia. If you ever needed proof that Romney is out of touch then that mid-20th Centiry mind set should convince you. That is the liberal rallying cry. What did you tune into MSNBC by mistake and thought is was Fox News Channel? Rudy NYC ... now you do say that knowing that Obama told the Russians, just wait until he got re-elected and he would be more flexible? Forward, not in "R"! 65,000 people watching the Presidents speach, instead of 2,000 watching R/R? Do you need any more truth? Yeah, Obama said something to that effect. What does that have to do with Romney's mid-20th century thinking? George W. Bush once thought the same way, that the Russians were the most immediate threat to the US. Here is National Weather Service's weather forecast for Charlotte on Thursday evening: A chance of showers and thunderstorms, mainly before 9pm. Partly cloudy, with a low around 72. Chance of precipitation is 30%. New rainfall amounts between a tenth and quarter of an inch, except higher amounts possible in thunderstorms...... I don't think they have anything to worry but bring ponchos just in case and have rolling & rocking time at DNC convention! Nobody can fill out football stadiums like Democrats. Romney couldn't fill out 1,200 seats at Detroit Ford Field last time he was there. Not enough wealthy buddies such as millionaires and billionaires around, other than tea partiers. Get ready for the DNC SNOW JOB.....the only weather that matters is WHETHER or not you're stupid enough to buy it again! And remember, it isnt a good time to balance the budget, we have more money to give away in exchange for votes before anyone is counting..
Weird – As usual your anti union rants indicate you are a unskilled worker who does not earn even a minimum wage, does not have health care, nor get the week ends off or work a 40 hour week. The unions built the middle class, and there is no middle class in a third world country. Somalia is a non union country. Fact checkers worked overtime last week with the lies of Mittens and Ryan. Yet right wingnuts refuse to accept the facts and blame real media for making their candidates look like middle school cheer leaders.